My first half marathon was a hot, humid day and a very hilly course. I enjoyed the experience, but the run was quite painful. For my second half I chose the Bay State up in Lowell, MA in October. The weather was going to be much cooler, the course much flatter, and I hoped that I would be in better shape by then. Training during the summer went well and I could tell that my pace had been improving. The last week before the race I had problems with some taper runs and had some anxiety about how I would fare on race day. In addition, I had several friends running the race with me and people there to spectate, so the whole day was setting up to be a different experience. My downstairs neighbors decided to have a party on Saturday night and so I did wake up a bit during the night, but nothing like the 3:00 loud cell phone call that happened before my last race. I felt pretty well rested when we headed out at 5:35 for Lowell. It was fairly easy getting to the parking area and Monica and I walked over to the Tsongas Arena just about 90 minutes before the start time. I was a little surreal seeing runners sitting in the arena seats, watching the Zamboni on the ice from the previous night's event (Riverdance on Ice) and sipping coffee or sports drinks. We walked around a bit, found a spot to stretch and warm up and waited for Bob and Geri to arrive. I guess because of the ratio of male to female runners the lines for the men's room were much longer than the lines for the women's room. Just after 7:30 we headed outside and got online at the porta-potties. It was cool, around 42 degrees but the sun felt pretty good. I was still wearing my hat but I handed that to Monica before Bob and I jogged off to the start line to warm up. We saw Wenzel in the marathon corral looking excited and anxious for the race. Bob was doing a great job handling the stress from his first race, and the longest run of his career. We found a spot in the half marathon corral, sang the national anthem, and just a few minutes after 8:00 the crowd surged forward and the two groups merged on the course. Within 30 seconds Bob was out of site and I was trying to settle into a pace. In my other half I settled into a 10:00 pace early on, and managed to maintain it most of the race. Here I ran mile one at 8:35 and mile 2 at 8:25 which I figured was too fast. I was afraid of going out too fast and burning out before the end so I consciously dialed it back a bit. The next three miles I averaged around 8:55, closer the pace I wanted to start at. I had been nursing a stitch in my side from about mile 2 and cutting back the pace helped work that out of my system. We had looped to the other side of the river and there was a strip of dirt and grass that runners could use and I took advantage of it. By mile 5 I was feeling better so I tried upping the pace again but kept jumping from about 8:45 to 8:55 up till mile 10. The course was a loop that we ran twice so things were familiar the second time through, which helped. Monica and Geri were cheering from either side of a bridge on the course, so they saw us 4 times along the way. They were both wearing bright puffy jackets in the cold sunlight so they were easy to spot. I tried to look good when on camera. Knowing they were there cheering was good for the soul, and made it easier to increase my pace when needed. The second loop went by fairly quickly, crossing the far bridge as the marathoners at a 3:00 pace crossed back in the other lane. A woman in purple passed me around mile 8 and was still in sight at mile 10; it became my goal to eventually pass her before the finish. At mile 10 I figured the stitch wasn't coming back and with only three miles remaining I should pick things up. Fortunately, there was still some gas in the tank. I dropped from 8:45 to 8:33 to 8:19 to 8:04, which may mean I should have gone out faster. I do feel like I could have run the race more consistently, but I'll leave the detailed analysis for another day. We turned into the baseball stadium and I saw Monica taking pictures as I entered the outfield. 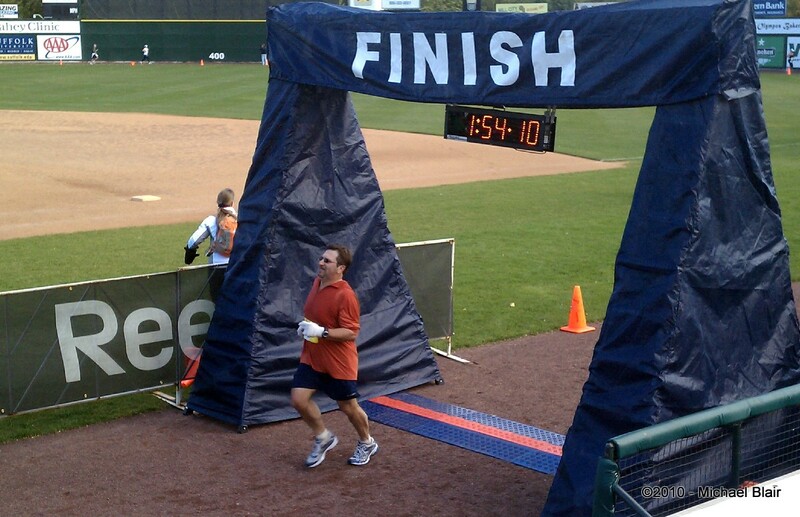 A sprint along the outfield wall and over the two bullpen pitcher's mounds and the finish line was right there. I knew I had beaten the 2:00 mark and was happy to see I had made it just under 1:54, a 16 minute improvement from June on a much friendlier course. The medal was nice but I really was excited about the Mylar blanket; to me that was the sign of a real runner. We met up with Bob (1:50) and Geri and Chris (1:44) along the third base line and put on some warm clothes. Dani (1:50) finished right after Bob but we never saw her all day. The food (especially the soup) tasted great after all that energy expended on a cold day. We ran into Mike and Monica (2:05) and hung out a bit more before going back on the course to cheer for Chris who was running the marathon. We settled in around mile 24.5 on the marathon course and cheered on the runners. They seemed appreciative of the encouragement. Chris came along, a bit behind her target pace but still pretty darn fast. It felt good to cheer on others after I'd finished, kind of closing the circle. We headed back to the stadium, stopping to tie a dropped child's froggy hat to the railing so it wouldn't get stepped on, and cheered her on at the finish. After Chris went by we headed to our cars, joining the stream of hobbling runners and helpful supporters on our journeys. We went over to Chez Chris and Chris for a fine BBQ, birthday celebration, and Patriot's game before calling it a day around 4 and heading home. 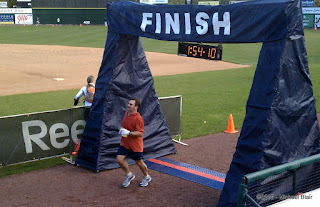 I could have run in a short sleeve shirt except for the 10 minutes at the starting line. I don't think it would have changed anything but it's good to know that once the race started the temperature was never a factor. It was cool to run wearing the gloves that my brother used in his first Boston Marathon. I know they're disposable cotton gloves, but I like using them. I noticed a great blue heron flying over the course near the river before the first bridge crossing. I think I was the only runner looking up at that time. Karma works -- the frog hat we picked up off the ground was Chris' nephew's hat and his grandparents saw it tied to the fence and retrieved it for him. I didn't have nearly as much pre-race anxiety as the first time. It felt much different at the start, with a plan in my head. Having people cheering on the race course is very important. Running on dirt = good.